Weird Hobby #267 – COUPONING! With the semi-popularity of Extreme Couponing, I wanted to share my own personal love of couponing. I came to couponing several years ago, well before the TV show, and while I do not get the same kind of deals the people on TV get, I do save a significant amount of money. First of all, please know that the people on the show are TRULY extreme cases (and achieved by some very extreme people). That’s not to say it’s impossible to achieve those kinds of savings, but it seems like the stars all have to align in the just the right place for those kinds of deals to happen. For instance, many stores have coupon limits, perhaps allowing you to only use up to 4 of the same kind of coupon per visit. Or they have item limits, where you can only purchase up to a certain quantity. Many stores also will not allow you to use expired coupons (some stores actually will, but they are rare). And then there is the problem of having the items in stock. When you have other people who shop at the same store you do who also like to coupon, you often run into shortages, requiring you to ask for rainchecks and running the risk of your coupon expiring. BUT, there are some really great deals to be had out there every week, and despite the occasional negatives, it’s well worth the effort. 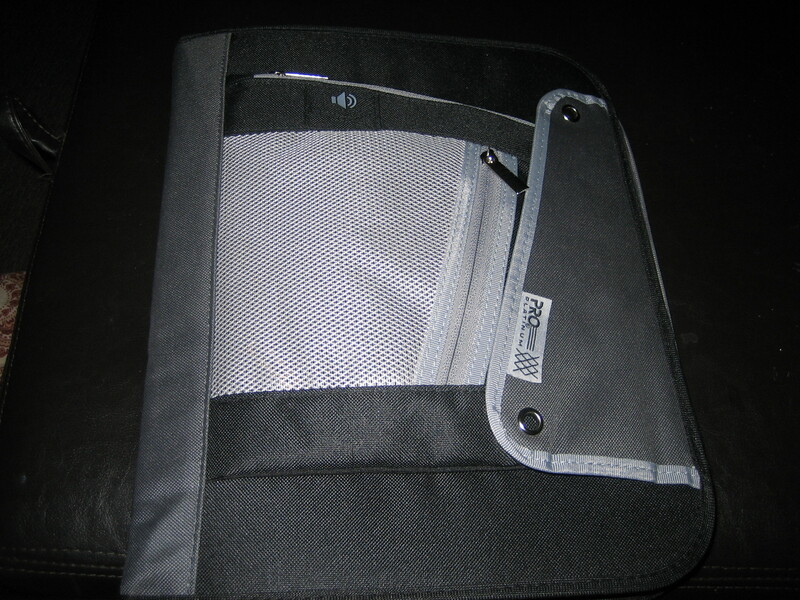 My zippered folder, bought cheaply at Walmart - I use the front pocket to hold pens, calculator and scissors. When I started out, I joined a website called GroceryGame.com. There are other couponing websites out there with similar goals, but I liked GG, it was easy to use and the people on the forums are always incredibly helpful and kind. The program on GG is fairly simple – you sign up for stores you shop at in your area, the weekly deals are put together in a List, you choose the items you want from your List, then you print it and gather your coupons. Each list will even tell you where to find the coupons for your items. But gathering the coupons always seems to be the biggest challenge. Sunday papers usually have inserts from several sources, most notably Redplum, Smart Source and Proctor & Gamble, and the spines of the inserts will tell you the date they were printed. There seem to be two main ways to keep your coupons among the GG crowd – the Weekly Binder or the Baseball Binder. 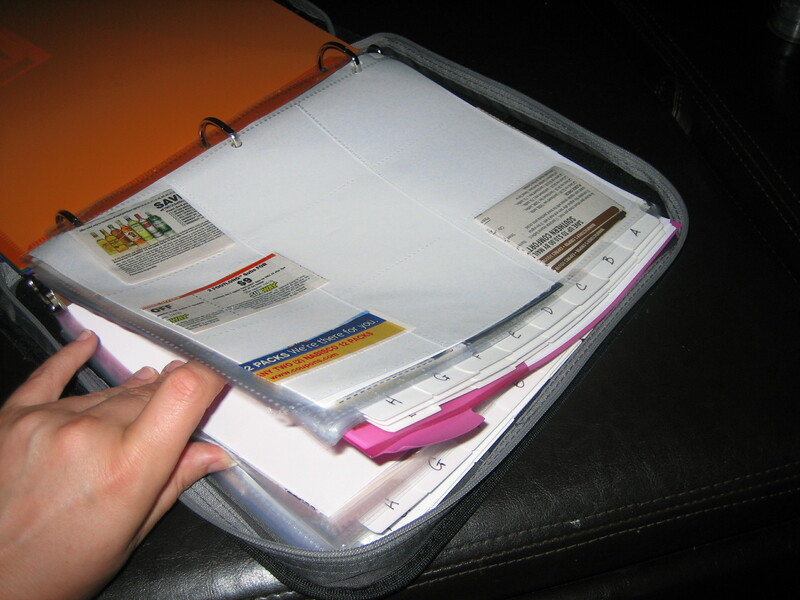 With the Weekly Binder, you simply put each circular into a binder that can hold about 3 months worth of inserts. When you print your List, it will tell you to look for a coupon you need in the Redplum insert printed on 2/26. Then you pull out that insert, thumb through for your coupon and clip it. The inside cover has these pockets, perfect for holding inserts I haven't cut up yet, or for holding coupons I won't use to give to others. The Baseball Binder can be a little more time consuming, but I’ve found it so helpful that I use this method. 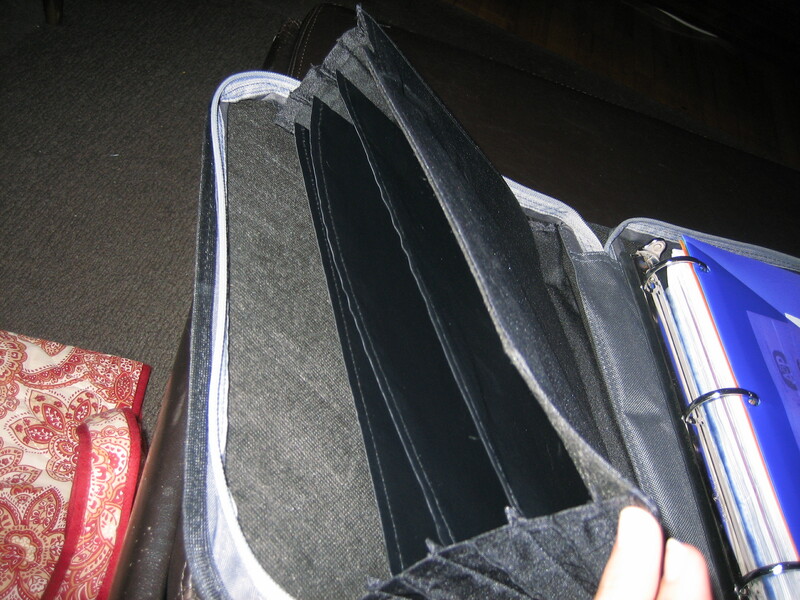 I have a zippable binder with baseball card inserts that are separated into two sections, and then alphabetically. The first section is for food/consumable items, the second is non-food/medicinal items, and I alphabetize by brand. When I get an insert, I clip all the coupons I think I would be interested in using, I sort them, and file them into the little pockets. When my List is ready, I simply flip to the brand, pull the coupon, and I am ready to go. The reason I find this method so much better than the Weekly Binder method is because I have, on occasion, found discontinued items or special markdowns that would not appear in a national grocery store circular (GG is very good about putting unadvertised sales on, but I am talking about a specific store’s “dent and scratch” discount area). By being able to open my binder and quickly flip to the brand, I can decide whether or not it’s a really good deal for me. Additionally, I do shop at non-List stores sometimes, and if I have my binder with me, I can take advantage of sales I find there as well. If I left coupons in their original inserts, it would take me way too long to flip through them to try and find that one coupon I think I remembered seeing… not worth my time. The goal of couponing is two-fold. Not only do you want to save the most money by stacking weekly store sales with manufacturing coupons, but you also want to stock up on the items you use so you have them when they are not on sale. Why spend $3.59 on a jar of peanut butter every 3 weeks, when you can buy 4 for $1.59 each and have 3 months worth for less than 50% off? It may not seem like much money, but it adds up. So why not save that money for something else? If anyone has any questions, I’m happy to chat more about it – otherwise, go forth and SAVE! Posted on March 1, 2012, in Food, Hobbies, Random, Websites worth checking out and tagged couponing, extreme couponing, food, grocery game, Hobbies. Bookmark the permalink. 3 Comments. I mostly buy from the healthy foods section.. organic, non gmo etc. I don’t really buy a lot of processed foods. Are there really coupons for the type of stuff I buy? ps: I found your site when I was searching for a coupon for wellspring trading co. ha! The only coupon codes for Wellspring we offer are by signing up for our monthly newsletter – you only get about 1 per month (sometimes a little late if we’re behind schedule! ), and occasionally we send out newsletters for special promotions (like right now we are doing a giveaway on Sacred Earth samples, here’s the link: http://tinyurl.com/mv6438o – less than 24 hours left!). Those special promotion emails are only about 2-3 times a year right now. As for health food coupons – those are definitely tougher to find. I get most of my freebees and great deals on all the laundry detergent, toiletries, cleaning supplies, that kind of thing. If you find a specific brand of health foods you like, I strongly recommend contacting them directly. I have often written to companies and told them how much I really liked their products, but also explained that I am watching my spending and ask if they have any coupons or where I could find them. Almost every one of them have sent me a thank you letter with a few coupons enclosed, and some will tell me where they usually print their coupons (since not all of them end up with the Sunday paper).